Hello, everyone. It has been a while since I've come to the forum, and even longer since my last tank. I would like to start up again and I was hoping to get some advice on Central American cichlids, since it is new territory for me. I have a 40 gallon breeder that I hpoe to be setting up sometime around spring. I have an Aquaclear 70 filter, 150w Aqueon heater (I may upgrade or purchase backup), and planning to use BD sand for substrate. I have a fake driftwood decor, planning on getting some large rocks, and I'd like to at least lightly plant with some hardy, low light plants. Found a LFS near me and went to browse and get some ideas for fish. I've been trying to do research on some different types, but it's just not the same as in person. Some types I have been looking into are electric blue acara, firemouth, ellioti, rainbow cichlid, convict, honduran red point, and salvini. Having trouble making decisions because I keep stumbling on new types of fish! I'm hoping to have 2-3 cichlids and maybe a school of dither fish, but not sure if that will work for my set up?? I was thinking 3 single species, 2 pair and another single species, or 2 pair or 2 single species. Most likely avoiding breeding pairs. My recent trip to this LFS, of what I was looking for, they only had convicts and firemouths together. I keep getting drawn to the convicts and watching them in person. Most info I have read on them pertains to breeding pairs and that they can be aggressive. I'm wondering if I could keep a single convict or a pair of females with other cichlids? I am also favoring the electric blue acara and maybe rainbow/ salvini for a pop of yellow. I could also get my color fix from a group of dither fish. Can anyone offer some stocking suggestions, or other cichlids to look into?? And any info about convicts would be greatly appreciated. I am considering the HRP as an alternative to them, but not sure if I'd be able to find any by me. Any tips would be appreciated. Thank you. I think your aquarium may be too small (by 10-20 gallons and tank dimensions)for Acaras, Salvani, and heaven help you if you wind up with a pair of Convicts. I would recommend the Rainbows and/or Firemounths. A group of three, single combination could possible be 1 Rainbow, 1 Firemouth and 1 HRP. Create a retreat for each species. Thanks for the reply. I keep getting a lot of different info as to what would work in tank my size. Either too many cichlids or not enough.. lol. So no electric blue acara?? Any info I found said they were a hybrid of the blue acara, and were a little smaller and more peaceful?? Suggestions were 30 gal tank, but that obviously doesn't factor in other cichlids. I'm crossing salvani off, as they seem to be rather aggressive after all. I'm starting to find info that firemouths may be too aggressive as well? Would the ellioti be a better alternative? "Would the ellioti be a better alternative?" Although I personally think I think the T. maculipinnis is a better looking fish, it would be about the same temperament as the Firemouth. I almost forgot about that fish. I guess you could flip a coin on that one. Would dither fish help mitigate any possible aggression? Would tiger barbs work, or do you have any other suggestions? I wouldn't recommend Tiger Barbs if you are going for a Central American theme. A group of swordtails should work though. http://www.teara.govt.nz/files/p15732pc.jpg Like this guy. Belonesox belizanus could also work, but their feeding may prove problematic. I'm not sure if I'm going for a "theme" per se, just more interested in the Central/ South American cichlids more than Africans. 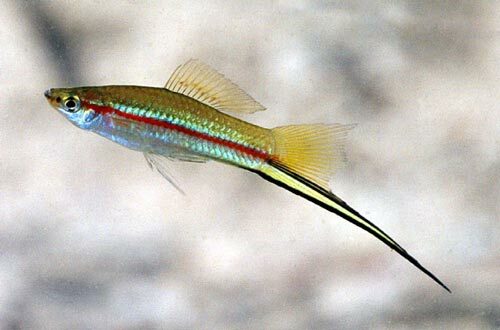 I had always been interested in small, schooling fish in the past, particularly cardinal tetras, but I'm trying to go outside my comfort zone and learn a little more. I really enjoy fish with personalities, and have been drawn to the cichlids for that reason. I'm not opposed to keeping a pair of one species, if they would prefer that, but I don't want to be overwhelmed with fry and it'd be nice to have something else in the tank other than 2 lone fish. Of course, I seem to be liking the most picky of cichlids.. haha that's just my luck isn't it?